Simply the best, and fastest at 1600spm by Pfaff the Grand Quilter is an ideal machine for the serious quilter, rather than the infrequent hobbyist. It is a semi-industrial machine designed for heavy duty projects, large projects or sewing long bulky pieces of fabric. 1,600 stitches per minute – no other quilting machine sews faster! Wonderful for stitching large quilts, but also for sewing regular long seams. Large working area! 225 x 150 mm (9“ x 6“)! No other quilting machine has a larger working area to the right of the needle. Absolutely essential for stitching large quilts or working with thick fabric or heavy materials. The generous work surface is perfect for sewing and handling large fabrics and it’s ideal for working with free-motion quilting. 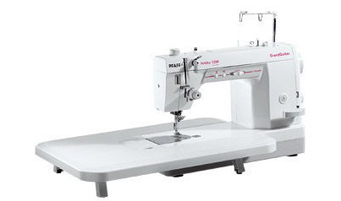 German design, the GrandQuilter was specifically designed to meet quilters’ demands. Thanks to the Automatic stitch control the stitches are perfectly adjusted no matter thickness of fabric. No matter what thread or fabric thickness you are using, the pre tension adjustment will ensure perfect stitches every time. Keep your hands on your project – thanks to the knee lift! When you are working with large pieces of fabric, you can raise and lower the presser foot with the knee lift. Needle stays in the fabric! With just the touch of a button, you can choose to leave the needle in the fabric – perfect for pivoting and handling your quilt. With a touch of a button both the upper thread and bobbin thread are cut. Even at the highest speed, the Pfaff GrandQuilter guarantees quiet, smooth sewing – without vibrations! Easy bobbin winding with a separate motor! Wind the bobbin while sewing. The separate motor makes it possible. Winding stops automatically when the bobbin is full. Fast or slow – you choose the right speed. Easily adjust the speed control slider. The large reverse lever can be activated with your elbow, leaving your hands free to guide the fabric! Easy threading of the needle! Heavy or lightweight fabrics – easy adjustment gives perfect presser foot pressure for each fabric. Stitch length can be set for a maximum of 6 mm.